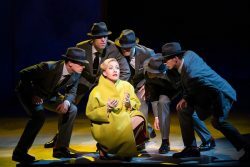 NEW York’s Metropolitan Opera has included Nico Muhly’s new work Marnie, based on Winston Graham’s novel, in its current repeartoire, and it will be beamed around the world by satellite on Saturday 10th November. Set in the 1950s, it is described as a gripping reimagining of the story of a beautiful, mysterious young woman who assumes multiple identities. Director Michael Mayer has devised a cinematic world for this extraordinary story of denial and deceit, which inspired a film by Alfred Hitchcock. Mezzo-soprano Isabel Leonard sings the title role with and baritone Christopher Maltman as the man who pursues her, with disastrous results. The conductor is Robert Spano. See Marnie live on screen at Poole’s Lighthouse at 5.55pm, with an encore screening on Friday 16th November at 1pm. Posted in The Art of Sound, The Play's the Thing on 5 November, 2018 .